We have tested the integrated use of magnetic gradiometry and Multi-Fold Ground Penetrating Radar for the Ultra-High Resolution non-invasive study of sites of archaeological interest. We used 3-D and 2.5-D MF GPR data acquisition, processing and interpretation coupled with vertical magnetic gradient high precision measurement. The tested methodology exploits the cost effectiveness of magnetic surveys and the 3-D and MF data redundancy to obtain enhanced images of the subsurface and to perform accurate identification and correlation of targets of interest as well as the reconstruction of full 3-D subsurface models. The method provides detailed information about radar wave velocities in the subsurface, which is essential for a precise lateral and vertical location of the targets of interest. Instantaneous attributes of the radar trace (envelope amplitude and instantaneous phase) are used to image targets of archaeological interest buried in chaotic soil conditions. Blind tests of the method were carried out at several areas of the Aquileia Archaeological Park (Italy). We demonstrate the effectiveness of the integration through the results of a study carried out at one of test sites, where magnetic gradiometry provided preliminary indications about existing NE-SW trending anomalies. The objective of the study was to assess the archaeological potential of a 5.000 sqm area intended for road construction. Targets of potential archaeological interest at depths ranging between 70 and 380 cm were identified from MF 200 MHz and 400 MHz GPR profiles. Such targets coincide with the location of an ancient Basilica, inferred from documentary evidence, and should be related to its foundations, an hypothesis to be confirmed by forthcoming excavation tests. - The solution is cost effective because MF GPR can be focussed on the areas of major potential interest identified from the preliminary magnetic surveys. On the other hand, the sensitivity of the two techniques to different parameters (magnetic susceptibility/remanent magnetization, conductivity, relative permittivity) prevents from using either of them, at least where magnetic and electric characteristics of the targets are not sufficiently known and constant over the area of study. We carried out a combined GPR and magnetic gradiometry survey in the Archaeological Park of Aquileia (Italy) during 1998 in the framework of a scientific cooperation among the Exploration Geophysics Group of the University of Trieste, archaeological research groups of the University of Trieste and the local Superintendency of Cultural Heritage. The primary objective was the study of a 6 sq kilometres area located on top of a moderately elevated hill (maximum elevation 4 m) named Beligna High. The area, which is scheduled for roadworks in 2000, was known from historical documents as the location of the San Martino Abbey, erected around A.D. 485 on the site of a paleo-Christian cemetery, and razed to the ground around the beginning of the 18th century. A precise location of the abbey is missing and the application of non-invasive geophysical techniques was therefore planned out to obtain information about the area, primarily including position, dimensions and nature of buried features of potential archaeological interest. A further objective of the study was the test of combined GPR and magnetic methods as a cost effective solution for the study of archaeological sites. Magnetic gradiometry was employed as a preliminary survey technique to focus the application of the costlier GPR on the sites of major interest. It was expected to provide results particularly as far as brick walls and foundations were concerned. 1. The identification of floors, foundations, ruined walls essentially made of limestone or bricks at depths ranging between 50 cm and four meters in sandy sediments. 2. Mapping of features of possible archaeological interest located at depths not exceeding four meters. 3. Test of integrated magnetic and GPR techniques to analyse correlations among observed anomalies and to evaluate the effectiveness of their combined use in archaeological studies. Targets of potential archaeological interest at depths ranging between 70 and 380 cm were identified from multi-fold 200 MHz and 400 MHz GPR profiles. Such targets coincide with the location of an ancient Basilica, inferred from documentary evidence, and should be related to its foundations, an hypothesis to be confirmed by forthcoming excavation tests. Aquileia is one of the most important archaeological sites in northern Italy and it was a rich roman town during the imperial period, with a maximum population of more than 200.000 inhabitants. A prominent commercial centre that connected the central and northern Europe with the Mediterranean area, Aquileia was first razed to the ground by Attila in the V century and successively abandoned for approximately 250 years before the beginning of the IX century. During this period the whole area changed into a marsh due to an uncontrolled water supply from previously canalized streams and springs. A layer of sediments of variable grain size (from sands to pelites) and average thickness not less than 100 cm deposited during this period. The layer is substantially preserved in wide sectors of the Aquileia archaeological park as the town never reached the extension of the imperial period again. However, intense agricultural and construction activities as well as large projects, such as a diversion or canalization of part of the main tributaries to the neighbouring lagoon, deeply modified the area and extensively reworked the sediment layer that protects the roman remains. The area is characterized by facies of alluvial plain with large marshy sectors evidenced by peat clays with fresh water faunas. We used a RAMAC digital GPR equipped with 100 MHz, 200 MHz and 400 MHz antennas. A high amplitude pulse (1000 V) was fed to the antenna element. The raw GPR data were stored in 16 bit binary format on a portable PC. We used a wooden framework to space out transmitter and receiver and speed up multiple common offset data acquisition. Proprietary software of the Exploration Geophysics Group and RADPRO software of Malå Geoscience were used for quality control during data acquisition. A 2-D multi-fold grid was completed to map dimension and orientation of the anomalies of potential interest. A maximum offset of 250 cm was used (200 MHz). The average maximum offset was 180 cm. We used a Geometrics G858 cesium vapor gradiometer to collect 4141 data points on a 40 x 100 metres grid which covers part of the area successively surveyed by GPR. Sensors were 100 cm apart with lower sensor located 50 cm above the ground. The acquisition of the whole grid was repeated five times to check the stability of the measurement and the final value at each grid point was obtained from the average of the 5 data value. Maximum variations of the vertical gradient as small as 0.04 nT were obtained from the different acquisitions. The data were filtered to remove spikes and long wavelength anomalies. Common Source (CS) and Common Mid Point (CMP) records helped discriminate signals of interest from noise components and select the optimum offset for single-fold data acquisition. Large cobbles at shallow depth are the main source of noise in most cases and show up as linear or (skewed) hyperbolic signals in CS and CMP records. CMP records were further exploited to calculate radar waves propagation velocities, of use to provide migrated and depth converted interpreted section to the archeologists. The DC component varies with offset and is affected by the first arrivals (Air-wave, Ground-wave). Standard algorithms fail to remove the DC component because of the influence of the high amplitude first arrivals. We implemented an adaptive algorithm which upgrades the time window size used to calculate the DC offset in order to minimize the DC residuals. The enhanced result can be appreciated in particular at small transmitter-receiver offsets. 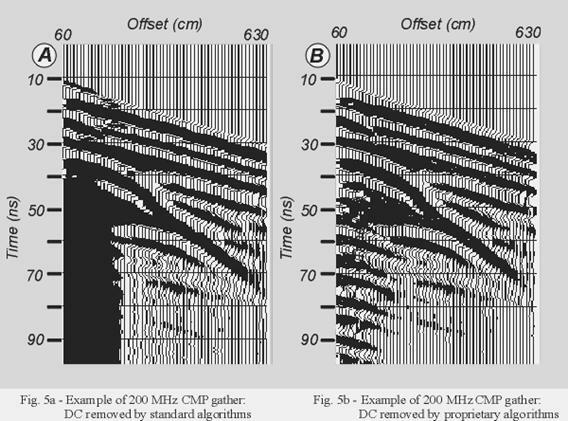 Velocity analysis of GPR data are normally performed on CMP gathers. We have performed multi-fold data acquisition along different azimuths at selected points of the acquisition grid. In this way we can analyse radar velocity variations which basically depend on the dip of the subsurface discontinuity. There is a more interesting effect on velocities associated with targets characteristic of archaeological sites, i.e. narrow and elongated features such as, e.g., walls and trenches flanking roads or utilized for irrigation in the past. Radar velocities measured across such targets are strongly dependent on azimuth when the contrast in dielectric constants is sufficiently large. Surface scattering affects part of the records due to large number of shallow diffractors (basically limestone chunks and brick fragments). The associated noise components exhibit hyperbolic or linear moveout depending on the record type (Common Offset section, Common Mid Point gather, Common Source/Receiver gather) and on the location of the scatterer (in-line/off-line). Pre-stack filtering techniques can be exploited to remove surface scattering. We used a proprietary algorithm originally developed to attenuate multiple reflections in marine seismic datasets. A model trace containing the surface scattering components is constructed at each offset. The noise to signal ratio of the model trace is further enhanced by applying a weighting function. The weighting function is calculated by means of an edge detection algorithm based on the Hough Transform. Pre-stack gathers, stack sections and velocity analysis panels were interpreted to map the anomalies of potential interest. The original GPR stack profiles, the migrated envelope amplitude and instantaneous phase sections calculated from the same data were used to analyse correlation between GPR reflectors observed in different sectors of the area of study. The eastern sector of the magnetic grid shows ENE-WSW anomaly alignments localized at the northern and southern margin of the study area. GPR data obtained across such anomalies show no evidences of discontinuities to approximately 350 cm depth. This is particularly apparent at the northern margin where flat, subhorizontal reflectors corresponding to the shallow sedimentary unconformities are observed. The penetration of the radar signal to at least 350 cm is verified in the sectors of the study area where reflectors at that depth are imaged. The possible sources for such anomalies should be therefore located at greater depths and they are probably out of the range of interest for the archaeological objectives pursued in this study. a. A sub-horizontal reflector, slightly inclined towards south, at an average 250 cm depth is observed across an area of approximately 1200 sq metres. b. The northern border of the flat reflector is a shallow, narrow (approximately 150 cm wide), ENE-WSW elongated object at average 70 cm depth which produces a strong diffraction in 4 GPR profiles. c. The southern border of the flat reflector is a sharp steplike feature, parallel to the northern border, which separates the flat, sub-horizontal 250 cm deep reflector from a deeper one, located around 350-400 cm, which shows a more pronounced dip to the south. Scattered diffractions are locally observed to the north in average conditions of flat sedimentary layering of no interest from the archaeological point of view. MF sections show the enhancement obtained from multi-fold techniques. We have compared all the GPR profiles with the magnetic ones to locate possible correlations. The maximum and minimum value of the superimposed gradient are ±20 nT respectively and the relative vertical location of the magnetic data is such as to emphasize the correlations between GPR and magnetic data. A correlation exists in the leftmost sector of the profile, while a prominent diffraction which marks the northern border of the flat reflector in the radar profiles does not influence the magnetic profile at all. a. Reflector: the strength of the reflection matches that of stone floors buried in the forum area, where the composition of the soil is similar to that of the Beligna High. b. Northern border: comparison with datasets from other sites of the Archaeological Park shows that the response has characteristics [amplitude, instantaneous attributes (envelope and phase) and diffractions] identical with those obtained from buried walls at depths ranging between 50 and 150 cm. c. Southern border: the sharp, linear margin is consistent with the termination of a platform-like buried structure. 2. The integration of magnetic gradiometry and GPR is a cost effective solution for rapid, high resolution surveys of sites of archaeological interest but direct correlation of gradient anomalies and GPR profiles is not always feasible, as demonstrated (e.g.) by the combined GPR and magnetic profile. Actually, one of the targets of major archaeological interest in the area is not correlated at all with the observed variations of the magnetic gradient. 3. In the study area magnetic gradiometry are apparently influenced by features deeper than the range of GPR [with the only exception of very strong (i.e.>200nT) anomalies of shallow and probably metallic origin] and therefore most probably located in the proto- and pre-historic layers of limited interest from the archaeological point of view. Such features may be related with materials deposited in the paleochannels across the bar which forms the Beligna High, whose orientation in the area of study is known from literature to be consistent with that of the observed anomalies. 4. Multi-fold GPR provides the necessary information to migrate and depth convert profiles as well as to enhance subsurface images. Moreover, the application of azimuthal velocity analysis techniques allows a more reliable correlation of anomalies across different profiles and the identification of elongated targets. The high resolution GPR images may greatly simplify magnetic data processing in case of correlation of magnetic and GPR anomalies. In this case, 2-D filters can be used to remove noise and isolate short wavelengths for a preliminary identification of the areas of interest from magnetic data, while GPR data can be successively used for a precise vertical and lateral location of targets. The authors thank Prof. A. Guarino, President of the National Cultural Heritage Committee and Dr. F. Maselli Scotti, Director of the Aquileia National Museum for their support of the present research work. We gratefully acknowledge the assistance of Georeflex s.r.l in magnetic field work. This work was supported by CNR grant n.96.05438.PF37 of the Italian National Cultural Heritage Project.